The 2011 Reserve Cabernet was made from grapes grown in four of Whitehall Lane's seven vineyard properties. It included select rows from the Leonardini Vineyard, Millennium Vineyard and Oak Glen Vineayard. The wine was aged in 80% French Oak and 20% American Oak barrels for 20 months. This is the final vintage of merlot from our Leonardini Vineyard. The small Merlot block was removed after the 2013 harvest. This single vineyard Merlot is a dense, saturated bottle of jammy red fruit. Complex and elegant with aromas of plum and black cherry, it is a true example of the exceptional 2013 growing season. “A Merlot for Cabernet Lovers”, this big, bold wine will catch you by surprise with its structure and smooth nish. With proper cellaring, it will continue to evolve through 2022. The Millennium MM Cabernet is made from grapes grown less than one-half mile from the winery, on the northern edge of the Rutherford AVA. This vineyard produces grapes that have been used in some of Napa Valley’s storied wines for the past half-century. This wine was made from hand-selected grapes in one small vineyard block. This Rutherford Cabernet is loaded with cassis, black berry aromas and chewy tannins that turn to a velvety finish. Enjoyable today but will benefit from cellar aging through 2032. 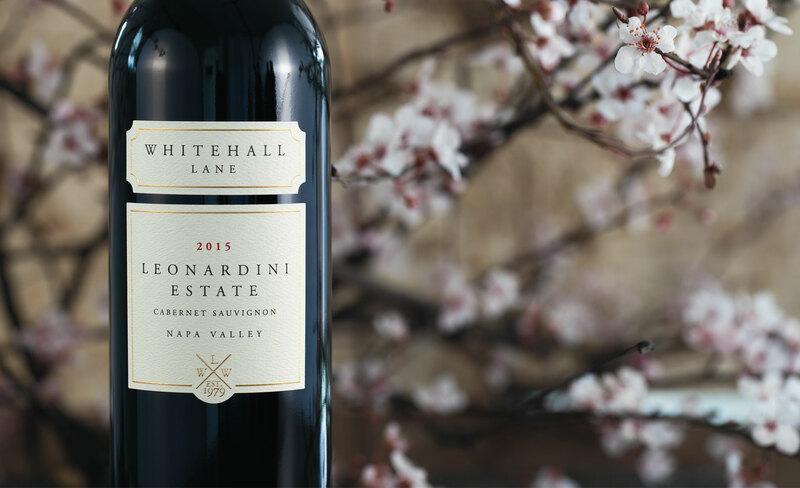 The Leonardini Estate Cabernet Sauvignon comes from handpicked blocks in Whitehall Lane’s Estate Vineyards. This 2014 wine was made from grapes grown in three of the Leonardini Family’s seven Estate Vineyard properties. It included select vineyard rows of Cabernet Sauvignon from the Oak Glen and Millennium MM Vineyards. This is a classic Cabernet Sauvignon. The wine has a deep, intense color and a distinct fruit center that begins with black cherry, violet and currant aromas. It is well balanced, elegant and sleek on the palate, delivering very long berry and cherry flavors through to the finish. The underlying tannin structure, complexity and ample fruit guarantees rewards to the patient collector over the next 12 or so years (about 2028). Its name translated from Italian means “left-handed thrower” and is an ode to our proprietor, Thomas Leonardini, Sr. and several other left-handed Leonardinis. Tom was a standout left-handed pitcher in his day with pin-point accuracy while delivering the occasional “chin music”. This Cabernet is also a standout and delivers all-star power and finesse from grapes grown exclusively in Whitehall Lane’s Oak Glen Vineyard in the Oak Knoll District. The wine is definitely a home run! 2014 Mancino Lanciatore offers a bold punch of aromatics and flavor. On the nose, there are fresh blackberries, dark chocolate, black currants, and a perfumed blueberry undertone. The palate offers big, round, and chewy tannins with dark, brooding black fruit, stewed plums, and Agen prunes. Richness and intensity dominate this wine, with toasty vanilla, cola, and mocha notes on the finish. We recommend decanting this wine for a few hours to help deliver a perfectly pitched flavor. This succulent and ripe Pinot Noir is beautifully balanced with supple flavors of strawberry, cranberry and sweet oak. Its mild tannins offer a smooth, lasting finish. The Millennium MM Cabernet is made from grapes grown less than one-half mile from the winery, on the nothern edge of the Rutherford AVA. This single vineyard cabernet is a classic. The aromas of dark cherry, berry, and oak leap from the glass. The finish is long with good firm tannins and lingering fruit flavors. 2009 and 2010 were both fantastic years, and this bold bottle has many years of prime drinking left in it.